These random grey stone pebbles shown here on the wall but are equally at impressive as floor tiles. These flat pebbles tiles are available as large random pebbles (6-8 weeks special order) which are shown in the picture or as a slightly smaller sized pebbles which are supplied from stock. approx.300mm x 300mm x 11mm thick. approx.450mm x 450mm x 11mm thick. 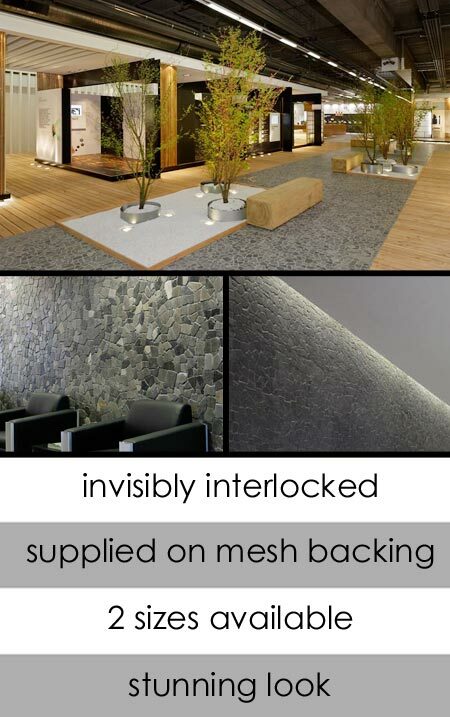 * Mesh backed for easy installation.